Microsoft and Yahoo announced Thursday the companies amended their search partnership, reaffirming commitments made by both companies in the original 2009 agreement. The two made some changes to keep the partnership "productive." Data shows the duo taking more global market share. Yahoo CEO Marissa Mayer said the renewed agreement opens "significant" opportunities in the partnership, as the company continues to serve Bing ads and search results for a majority of its desktop search traffic. The update includes improvements in two areas. The revised deal gives Yahoo the ability to enhance the search user interface on any platform from desktop to mobile. This year eMarketer estimates the combined network will own 6.5% of the $81.59 billion search market globally. Bing grew global share from 3.7% to 4.2% in 2014. The agreement also changes the sales organizational structure in terms of how the ads are sold. The companies plan to transition responsibilities for managed advertiser sales this summer. While Yahoo will focus on selling ads for its Gemini native ad platform, Microsoft will sell Bing Ads delivered on its platform. Integrating the sales teams will allow the duo will bring efficiencies in ad buying, selling and serving, per the companies. Satya Nadella, CEO, Microsoft, said the global partnership has benefited its shared customers during the past five years. Those "shared customers" continue to help the duo increasingly take search market share. Bing and Yahoo have picked up 5% of U.S. paid search click share in the last year and now control 21% of the U.S. market, per Merkle RKG. Yahoo's deal with Firefox becoming the default search provider remains a big factor in the uptick, shifting about 2% of U.S. search ad clicks from Google to Yahoo, said Mark Ballard director of research for Merkle RKG. Overall, marketers spent 13% in the first quarter of 2015 on Google, while Bing and Yahoo rose 36%. The numbers show much faster growth for Bing and Yahoo, compared with Google, as a result of more marketers using Bing Product Ads, Ballard said. "We see Bing Product Ad volume up over 400% year-over-year. One of Yahoo’s main concerns with the Search Alliance is how well Bing is monetizing the results." he said. Ballard also points to how quickly Yahoo has shifted mobile search ad traffic to its Gemini platform. "For advertisers adopting Gemini, 36% of their combined Bing and Yahoo mobile search ad clicks were produced by Gemini in March 2015," he said. "That is about double the rate from six months earlier." 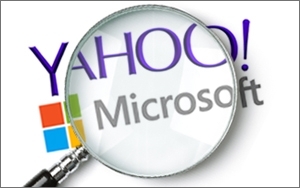 The Yahoo-Microsoft partnership formed in 2009 by both company's CEO predecessors gave Microsoft exclusive rights to provide paid search services on desktops for Yahoo's search engine. The alliance included a revenue-sharing agreement where Microsoft pays Yahoo a percentage of Bing Ads revenue delivered from Yahoo searches.